His Eminience Taglung Yonzin Rinpoche was born in 1973 in ShangriLa, eastern part of Tibet. At the age of five, he was ordained by Ven Yonten Rinpoche and begin a two year period of monastic education at Rabgyeling Monastry. In 1993, propelled by the great wish of deepening his understanding of Buddhist Philosophy and practice, Rinpoche made his way, alone, to India. Rinpoche then joined the Drikung kagyu Institute in the northern part of India. There, for five years, he studied Buddhist Philosopy, meditation, rites and rituals. Rinpoche also took his monk's vow from His Holiness Drikung Kyabgon Chetsang Rinpoche. In 1997, His Holiness Taglung Matrul Rinpoche recognised him as the reincarnation of the 8th Taglung Yonzin Lhunpo who was the tutor of His Holiness Dragpa Tenpai Nyima. Thereafter, Rinpoche went to retreat in Labchi, the holy place of the great Saint Milarepa. 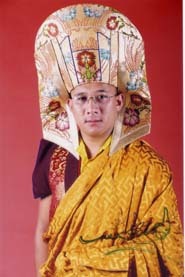 In 2001, Rinpoche attended the Great Snake Year Teaching of the Drikung Kagyu Lineage for four months. After the completion of the teaching, His Holiness Drikung Kagyu Kyabgon Chetsang Rinpoche, His Holiness Taglung Matrul Rinpoche and His Holiness Taglung Shabdrung Rinpoche formally enthroned the 9th Yongzin Rinpoche in the presence of 700 monks.